When there is an explosion whether it be an explosion created from chemicals, gas, dust etc it is not just the blast itself that can cause damage to the immediate area it is also the effects of the shock wave that forces its way into the building by bursting in through the windows and the doors throwing debris and shrapnel in its path creating a path of destruction, this can cause extensive damage to the interior of the building which in turn could result in the building collapsing and could cause serious injuries to your work force. 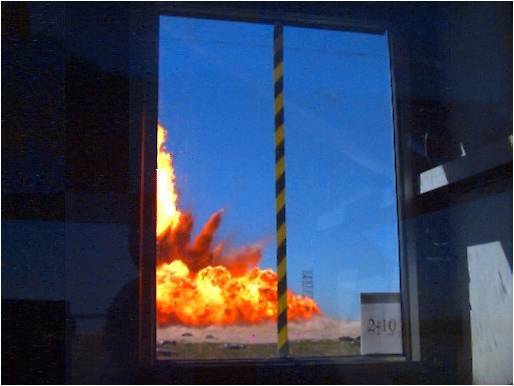 Fireblock Blast resistant steel door-sets provide protection from explosions and shrapnel by providing a barrier to block the explosion and protect people and property on the other side. Our Blast Resistant Doorsets have been dynamically tested to ISO16933 standard with ratings of up to 53 Kn/m2 by an international independent test laboratory. Fireblock Blast Resistant steel door-sets combine blast and pressure resistance to provide you with the best protection needed in the event of an explosion while functioning similarly to standard hollow metal door without compromising on its aesthetic appearance. They have been dynamically tested with ratings of up to 53 Kn/m2 so you can rest assured you are getting maximum protection. Our Blast Resistant steel doors are suitable for areas such as the pharmaceutical industry, banking, aerospace and defence and petrochemical industries, along with having high blast resistance our doors can be designed to combine fire integrity and acoustic performance to very high levels resulting in a door that will offer you maximum protection from all elements. Fire block has the solution to your needs.